We sense this, I think. We sense that where our treasure is, there our hearts will also be. That the holes in our lives are never filled by more stuff, more food, more activity. To attempt to arrange an outward lifestyle of simplicity without the inward reality leads to deadly legalism. Simplicity is a way of cutting out the “McNuggets” portion of our belongings, our schedule, our talk, and our preoccupations that connive us into thinking we’re nourished, full, and happy. I’m reminded of my friend Ashley, who shares a compound with Monica. Ashley has a cutie-patootie four-month-old, and their home is far simpler than mine. I recalled to her my first trip to Babies ‘R’ Us, and distinctly thinking, “How did Adam and Eve do this? !” I love that Ashley is giving their son a gift far better than all the little gadgets and mind-stimulating toys that, perhaps, mimic the outdoors her son will actually grow up in. She’s giving him the gift of less stuff. Now that’s what I call a baby gift. For more thoughts on simplifying read Janel’s post here. Oh my goodness. Mom’s everywhere are struggling with this even when they don’t acknowledge it! Freedom is great in this area of life! Janel. I started reading this post and thought, “Wow. This is really resonating with me.” And then I got to near the end of your post and realized (part of) why. My husband, four kids (12 and under), and I also just moved back from Africa. Chad, actually. And your second-to-last paragraph could have been written by me. The 18 bags, 51 lbs. each. The ridiculous carry-ons. And even with all of this, feeling like we had given up so much in America. Then, 5 years later to have to redo this exact same painful process as we left. I felt like I had to learn the lesson all over again. I somehow felt that if we couldn’t bring everything we loved back with us from Africa, we would “lose” part of our experience there. But God reminded me again that possessions are NOT the memories. They may serve to remind us visually, but they are NOT the person who gave them to us, or the place we got them. We don’t invalidate or dishonor our relationships or experiences by parting with the physical remnants of them. Here is something I wrote last year as we were preparing to leave Chad and move into our new home back in the U.S. I, too, wanted to remember that home is more than possessions. I hope my reflections bless you, as yours have blessed mine. 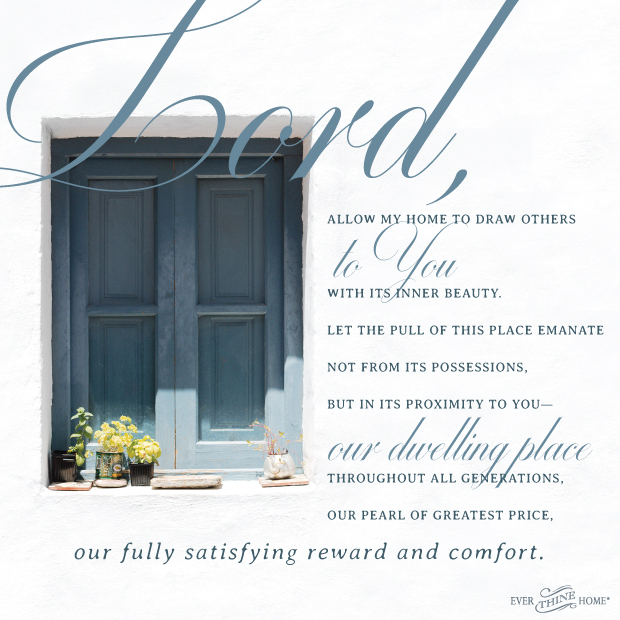 I have dreams to fill this house; to make it a refuge and a place of beauty for all who enter. But let not my dreams be so short-sighted that they are limited to bed linens, picture frames, and Ficus benjamina. I have dreams for You to fill this house, Lord. Fill it daily with people, with love, with peace, with laughter. And with tears at the right time. Fill it daily with learning, with teaching, with working, with improving. And with rest at the right time. Fill it daily with welcome, with hugs, with kisses, with words of encouragement. And with words of reproof at the right time. Fill it daily with communicating, with listening, with singing, with rejoicing. And with stillness at the right time. Fill it daily with forgiveness, with compassion, with humility, with grace. And with Your Spirit at all times. Father, come fill this house. And make it Home – because You dwell with us.